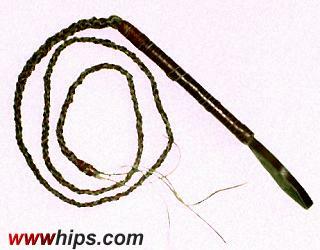 This is the cheapest example of a, let´s say, bullwhip-like instrument. The handle is roughly wrapped with several strips of leather, put together with some rivets. The thong is made of leather lace twisted like a rope and fixed with a simple knot at the point. Not recommendable for anything except decorational purposes.